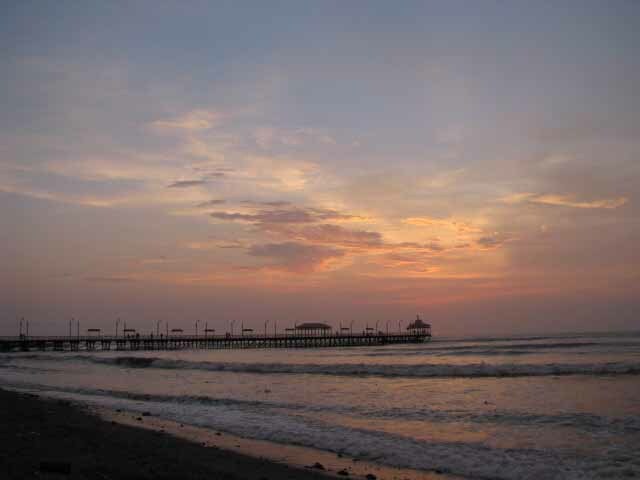 Huanchaco is a beach hamlet on the coast of Peru about 15 minutes drive from the city of Trujillo. A place to chill out after spending some time in the vibrant but frenetic city and after visiting the dusty sun-baked archeological sites of Chan Chan and Las Hucas del Sol y de la Luna. All of the above are easily accessible by bus or colectivo – although trying to identify where they leave from (it’s a big city) and what number will take you there can be hard work if you don’t speak Spanish. Despite being given very good maps and directions by tourist information in the square catching the right colectivo at the right place was still very hit and miss and at times I ended up travelling in the wrong direction and visiting parts of the city that tourists don’t normally venture out into. In Peru there are a huge amount of sites to visit and I became inca’ed out very quickly as we worked our way down the country. My advice for the layman in all matters concerning ancient civilizations is to pick carefully where you chose to go. In the case of Chan Chan versus Las Hucas del Sol y de la Luna, I would definitely recommend the latter. Harder to get to but much more to see. So having pounded the pavements of the city, been covered in dust and sand wandering around barren sites and been stalked by a strange man (see please go away blog), we escaped to the beach. Where we found great places to stay and eat – although being out of season it was pretty cold and very quiet at night. 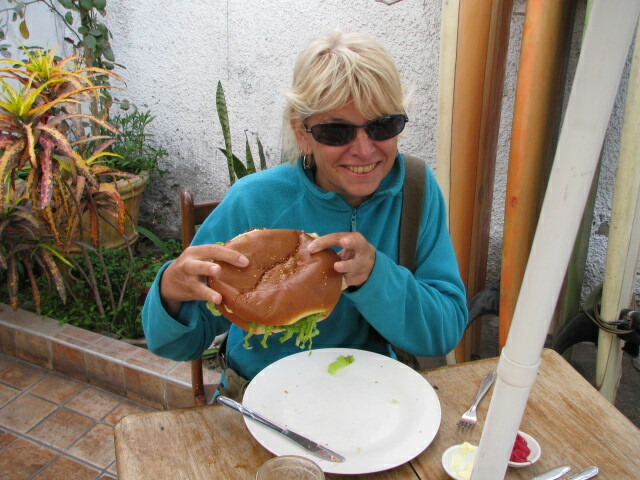 It was here that I found some of the best food in Peru and discovered the world’s biggest burger on sale. When I ordered it I was expecting something higher rather than wider than your average big mac. However, when it was served it totally covered the dinner plate and eclipsed my face when I held it up in front of me. The waiter, being used to the looks of incredulity/horror/joy, plonked the plate down in front of me with a ”finish that it you can” smirk. “Where’s the chips?” I asked without batting an eyelid. He looked disappointed but had a good laugh as I held the burger up to my face for a photo op. Unfortunately, the owner also found it funny and insisted on taking a couple of photos to use in her next advertising campaign for her humongous burger. I learnt a few things about big burgers that day. They are impossible to eat quickly and become unappetisingly cold with each bite after the half way mark. Are good entertainment value. There’s way too much bread. You can go halves with someone, get real value for money and fit in the chips. Unfortunately, I can never return to Huanchaco in case I’m recognised as the face that launched a thousand big burgers. Ah well, at least I got some free chips.